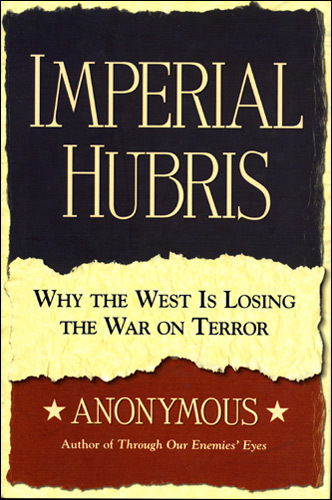 Written by a 22-year CIA veteran who led the hunt for Osama bin Laden from 1996 to 1999, IMPERIAL HUBRIS is probably the most important book about the War on Terror. Author Michael Scheuer explains how Bush policies are like gifts to bin Laden and other jihadists, feeding their deepest fears of Muslim conservatives that Islam itself is under attack. While Bush insists Islamists "hate us for who we are," the truth is that they see themselves as fighting a defensive war against foreign aggressors. As a result, anyone who fights the U.S. is viewed with great respect, and suicide bombers revered as heroes of "self-sacrifice, patriotism, and worship." Scheuer shows that our occupation of Iraq and Afghanistan is making the U.S. less safe, and Americans need to realize that our country is now at war with the entire Islam world, and we are badly losing that war. Bushs foreign policy is radicalizing Muslims around the world at a faster pace than bin Laden ever imagined, and were doomed to fail if we continue to rely on a military defense and not diplomacy. This book is essential reading.